As of today, I'm 39 and entering the last year of my 30s. I definitely don't feel 39. I've spent the last few days looking through old photo albums, at all the great memories I've acquired over the years, and all I can think is... where did the time go?! I'm reminded of a line from The Muppets Take Manhattan, one of my favorite childhood movies. In the last scene, as Kermit and Piggy get married, some of the wedding guests get a chance to sing. The old ladies, all sitting in a row, lament, "Years go passing day by day." It's so true. The years just fly by, and all you can do is hug your loved ones and spend as much time with them as possible. After all, that's what really matters. Since today is my birthday, I wanted to wear something truly beautiful. I am absolutely in love with this Alice + Olivia dress, so I have been saving it to wear on a special occasion. I guess today will do! I love every detail, from the cap sleeves to the floral embroidery. It's a fashion masterpiece. 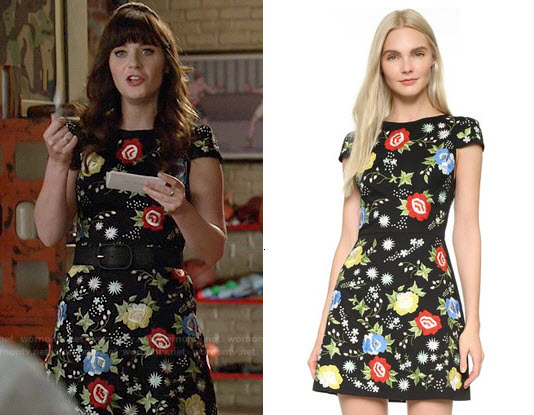 Zooey Deschanel wore the dress last season on New Girl, though she paired her dress with a black belt. I decided not to do that here, since the dress already has good definition at the waist, and I really wanted to bring attention to my shoes. I'm in love with these Sophia Webster shoes, too. One shoe says Boss, while the other shoe says Lady. 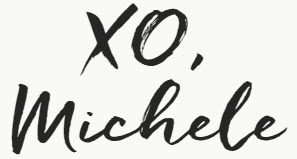 They are perfect for me -- so fierce -- and the perfect accessory on my birthday. You can still buy the pumps -- in pink -- at Saks Fifth Avenue. Warning: This brand runs very small (by a full size), so size up. It's appropriate I'm wearing these Boss Lady pumps today, since I'm currently watching Girlboss on Netflix. Inspired by Sophia Amoruso's book of the same name, Girlboss explores the tattered beginnings of the Nasty Gal brand. Although the company recently filed for bankruptcy protection, Sophia's story, at least as told by Netflix, is still a very interesting one. I'm working today and the rest of this week, so I don't plan to really celebrate turning 39 until the weekend. Chapin did make waking up today extra special, though; he surprised me with a pair of beautiful ruby and diamond earrings that I'm wearing in these photos.